We couldn't ask for a better experience and would highly recommend Dj Vishal (Vicious) and his entire team. We had a 3 day wedding in multiple locations and every single event was done to perfection! We received so many compliments from our friends and family about the dj. We gave Vishal a general direction and he ran with it flawlessly. During the reception we rearranged some things and deleted some things and it didn't even make him flinch. He was calm and cool the entire time and helped keep me that way. I just wanted to reach out to say thank you to you both for making our day so special. We had a fantastic time and we appreciate so much all that you both were able to do during all of the crazy at the ceremony and completely turn up the reception. I think the part we finally got to enjoy about our wedding was being on the dance floor and getting lost within our friends and the music. Our friends are still reaching out to us saying it was the best wedding ever and that the dance floor was packed from opening to end. You both did an amazing job with music, ambiance and hype. We cannot thank you both enough. 11/10 will recommend Dynasty Ave to all of our friends. Ravi, we enjoyed working with you and thank you so much for seeing through all of our requests, emails and anxiety! Thank you so much for making Club Manatee happen. You perfectly captured the theme we wanted and made it possible. Thank you so much!!! If there is ever anything you need from us, please let us know! Thank you once again for everything!! DJ Vishal was absolutely amazing! 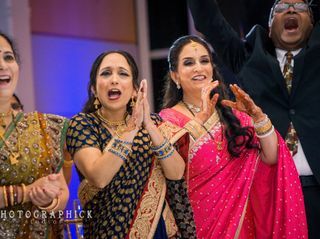 We had an Indian-American fusion wedding, with a very specific timeline and cherry-picked aspects of both cultures integrated into our special day. Vishal was very responsive to our texts and assisted us with all our questions and needs. His team was set up and ready well before the wedding, and Vishal definitely came fully prepared. He handled the ceremony well, superbly emceed our reception, and crafted a dance playlist that perfectly played to our diverse audience. The whole crowd was on the dance floor! The week of the wedding, we had a sudden additional A/V need for the night before. After the venue's in-house A/V team quoted us an unaffordable price, we contacted Vishal, who arranged delivery of a big-screen set-up for only a third of the venue's price. Thank you Vishal and the Dynasty team for helping us out and making our entire wedding experience awesome! Guests had a great time! DJ Ravi and Smarty DJ'd our sangeet and wedding/reception, and they did a great job! Everyone had a fun time, and they were great about taking requests and going with the flow. We are pleased with our decision! On the dance floor all night! 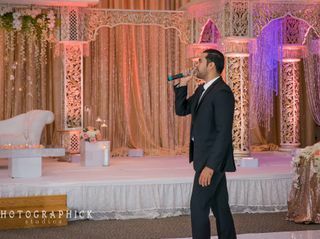 DJ Ravi and his team did a wonderful job doing the AV, DJ, and lighting services for both of our wedding and reception! They were extremely professional, responsive, and helpful throughout the whole process. We had many guests tell us repeatedly how much fun they had on the dance floor and that is all attributed towards a great DJ! They kept the dance floor full and fun, we had a blast with this team! Dynasty AV did an excellent job at our wedding! They performed DJ/MC services for my best friend's wedding and were my go-to option when it was my turn to get married. DJ Vishal (AKA DJ Vicious) was excellent. Despite having a very hectic schedule he was responsive and friendly. Despite the threat of a hurricane he remained optimistic and reassured us. He was reachable by e-mail/text and would respond as soon as he could. He was able to accommodate most music requests and was able to pull from an extensive song library for some random song requests. The music/dancing was definitely a highlight of my wedding thanks to him. I'd recommend getting in touch with them early as they tend to book up. Thank you so much and congrats again! 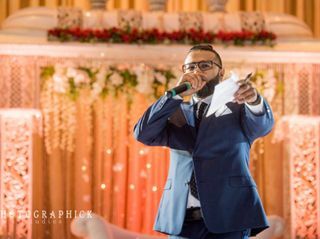 Ravi was the DJ for our Sept 2018 wedding at the Willard Intercontinental Hotel and Smarty was the MC for reception. Both were present for our vidaai and baraat as well. I cannot say enough good things about these two and if I had to do my whole wedding over there are certainly vendors I would change out but Dynasty isn't one of them. They are both very easy going individuals who still take your preferences and interests seriously. We had a fusion wedding as I am Hindu Indian and my fiance isn't, so I was worried about how the baraat would go considering it would be the first time for so many of the guests. I spoke to Ravi and Smarty about these concerns and they made a plan to do a "baraat demo" and teach some basic dance moves to the guests at the baraat which really hyped up the crowd. They were on time and on point for the vidaai despite the rain, and for the reception our dance floor was packed even at 11:55 PM. Again, having a half indian half non indian crowd, they did a good job of reading who was on the dance floor and mixing it up. Also they were pretty flexible and open to song suggestions. 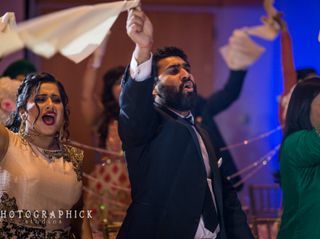 Lastly, I did a surprise dance performance for my fiance which required making a cut of music MULTIPLE times (we also had a bhangra team perform and some other cuts made for first dance), and Ravi did them all immediately. The last thing I will say is that there are a lot of overpriced DJs out there. Overall I think Dynasty has very fair prices for what you are getting, and still came below the averages of several other DJs in the area we looked at. It was a BLAST, thank you for having! Congrats again! DJ Ravi and DJ Smarty from Dynasty AV and Entertainment are an amazing team! Thank you guys for making my event a memorable and awesome one! I love you guys and keep up the amazing work! It was LIT! Thank you and we love y'all! Dynasty AV & Entertainment was absolutely amazing. We worked with Karan Kapoor and Smarty Singh who were both extremely professional. Dynasty AV & Entertainment was able to make our wedding a huge success! We loved how they had a variety of packages and worked with us to customize one that worked best for us. 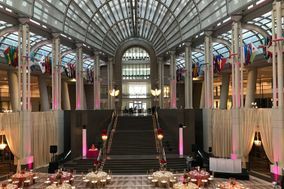 They worked diligently with our decorator to get the perfect lighting for each event, and our planner to make sure everything was on time. Karan and Smarty were fantastic and kept our guests dancing all night! We loved working the entire amazing weekend! Richmond always keeps it hundred! Congrats again! Working with the Dynasty AV team, and DJ Ravi in particular, was a fantastic experience. They were very responsive and helpful throughout the planning process, and I knew they were going to be ready and prepared on the weekend of. More importantly, the music was incredible! DJ Ravi played non-stop hits, and our guests never got off the dance floor. They all really enjoyed themselves, and I got lots of compliments on the music. Don't look any further than Dynasty AV - easy choice! It was an EPIC night! Congrats again! DJ Smarty & DJ Vishal did an incredible job at our wedding! 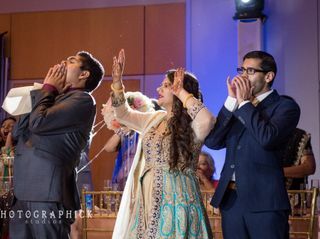 We were absolutely thrilled with everything from the baraat to the wedding background music to the reception! For the baraat, they came prepared with a sidewalk friendly cart and kept the party well organized and bumping! The reception music was exactly what we had requested and discussed prior to the event. Not only were the 2 of us happy with their performance, but our parents, families, and friends have not stopped raving about our awesome DJs! I cannot thank these guys enough for their part in making our weekend the best party ever, and I wish them all the best in the future. I hope to see you guys at future weddings we attend! Thank you! Such a fun weekend, thank you for the love! Congrats to you two! Words cannot even begin to describe how amazing Ravi and Smarty are! Both of them made our events so memorable. The music kept our guests on the dance floor for all our events. Smarty's emcee skills kept our guests entertained and our program on track. The lighting they provided added to the ambiance of our events. Ravi was our DJ for all three of our events and the selection of music for all the events was on point. We heard DJ Ravi’s Soundcloud mix a few years ago and knew he was the DJ for us. We enjoyed the entire process from the beginning with him. He is very responsive and flexible. He worked with us not just during the planning process but during the events. He was one of the reasons our events turned out the way they did. We are so thankful for Ravi and his team and will continue to work with them in the future. Many of our friends who will be getting married in the next year want to work with Ravi. He gets booked very quickly, so I would recommend reaching out to him as soon as possible. Music is what really determines how much your guests will dance and enjoy themselves and DC Dynasty did just that for us. Another DJ from Ravi’s team, Vishal, helped us put all the songs together for the performances. It has now been a month since our wedding and our friends and family still keep talking about the music and the emcee at our wedding. When we think back about all the events, we remember the music and being surrounded by all our friends and family on the dance floor the ENTIRE night. Some of our friends said they danced more at our reception than they did at their own because of Ravi and his music skills. We are so glad we went with Ravi! Best choice for DJ ever! Our family from Toronto even said that they haven’t been to a wedding with a DJ as good as Ravi. Again, we are so thankful for Ravi and his entire DC Dynasty team!!!! Thank you for making our once in a lifetime events memorable! You two are amazing peeps! Awesome weekend, congrats and hope to see yall around! DJ Dynasty was a pleasure to work with! We had Dj Korupt (Karan) and he was a absoulte delight, extremely professional, very flexible and always happy to help. Gave amazing ideas and even offered help to make our mix and made sure we were at complete ease during our events and before. They showed up on time and made all guest dance their butts off. 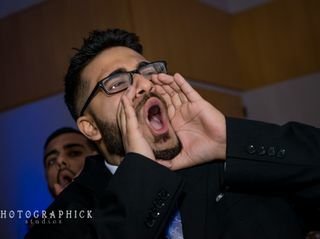 We also had hired a Emcee for our wedding, (Smarty) he was also so professional and so accomodating to us he made sure everything ran smoothly and kept everything in order was the best thing we could have had at our wedding he really kept everything in check. Smarty and Karan worked so great with the family and were VERY respectful! Would definitely hire for all and every event! Ravi went over and beyond to provide mixes for our dance performances and accomodated the music for a range of age groups. MC Smarty did such a great job pumping up our guests! It was so easy to work with them and much more reasonable price-wise compared to overly-priced DJ services out there! DJ Vishal and MC Smarty were fantastic. They were responsive to our needs/wants and played awesome music keeping the crowd hyped and entertained. Multiple people came up to us and loved the music at the wedding. I also loved how they kept the baraat going with some old school rap since they knew I liked that with my low rider. They made the wedding epic. Dj Karan and MC Smarty were the best! Everyone was so happy with the vibes they created for the wedding events. We had a fish fry on the beach in Turks and Cacios the night before the wedding. They were able to create a fun island atmosphere infused with Indian music. Everyone had a blast. Not only were they amazing with the music selection, but they kept everyone laughing. They also created spontaneous fun moments with dance battles. They came as djs but left as family. I'm so lucky to have had them involved in the wedding process. They were both extremely professional and very personable. They made our wedding very special. Big thanks to them!!! I will be calling them for all future events :) P.S. I found them at a wedding I attended in Washington d.c., I knew I had to have them at our wedding in Turks and Cacios! My husband and I hired Dynasty AVE for our wedding and pre-wedding events. They had all the best Gujurati music for our Garba. Smarty and Vishal MC'd our reception, and they had everyone on their feet cheering for our and our families. Our guests are still talking about our wedding. DJ Ravi killed it at the reception! The entire dance floor was packed with people from ages 5 to 89 years old!! One of the best DJ/MC to work with, they are so easy to reach and extremely friendly. They definitely put their clients needs first. Thank you to the entire Dynasty team for giving us the best memories! 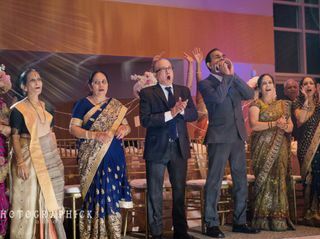 DJ Ravi and his team did an incredible job with DJ'ing our Baraat and Reception. Our guests loved it and the dance floor was buzzing. Definitely exceeded our expectations and will absolutely recommend them! Had an excellent time with Ravi Prasas! this is our third time using his services ! Music selection was excellent and was mindful of our song selections! We will recommend him to anyone ! Thanks so much Ravi ! Ravi, Smarty, Vishal, and Navi were an AMAZING team for our wedding. From the beginning, Ravi has been very quick to respond to my inquiries, explained everything well, and sent me the contract in a very timely fashion. The whole team made the wedding so fun! They had a ton of energy and had the crowd dancing until 1 AM. We received lots of compliments about the music during the reception and Smarty's MC-ing - Our guests loved him. We used Dynasty for lighting, DJ services, the dhol player, the baraat, AV, and Projection screens. My husband and I highly recommend them! Vishal is one of the major reasons why my wedding was so much fun. He is so good at understanding a crowd and figuring out what will make people dance. For example, our baraat was majority non-Indian, but with the way he got people hyped up, you would have thought they were bhangra/indian dancing experts! We had pretty diverse guests, so he made sure to appeal to both the Indian and American crowd. I also love that I was able to send him my song requests and he had no questions--he just made it happen. Finally, he transformed my ballroom using really beautiful colors and lighting, working closely with my other vendors and making it a nice surprise for us. Vishal is an amazing DJ and you should absolutely hire him for your wedding.